Inevitably, the start of each day now gets further and further from our base of operations and as such we have to get up earlier and set out earlier. 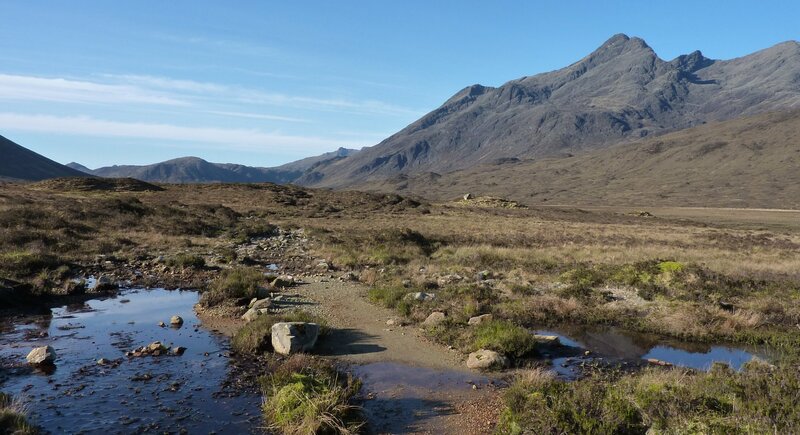 The journey to the start point, the Sligachan Hotel took us about 40 minutes, but I was still ready to go by 07:50, setting out into a beautiful morning – yes, I know, another one – it’s getting tedious isn’t it? Apart from Day Three, each day has been increasingly better than the last so far, and today proved to be another in that vein. I think today of all days had been the one I was anticipating the most on this walk. 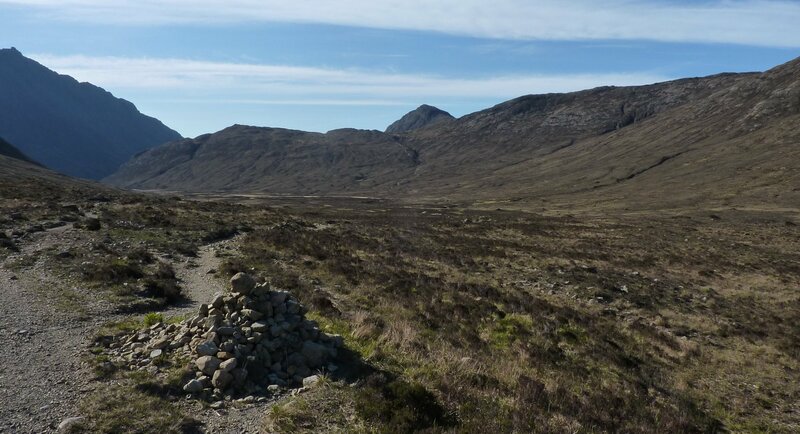 The path into Glen Sligachan is one I’ve wanted to walk for a long time, but never really had the opportunity and the weather today was the icing on the cake. 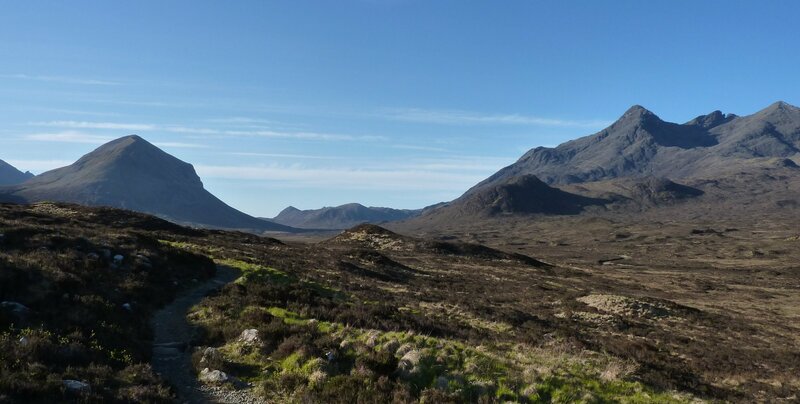 If yesterday’s track beside Loch Sligachan had become an instant new favourite path, then todays track down Glen Sligachan was an immediate candidate for “Stuart’s Favourite Path Award 2012”. It’s brilliant, especially in the morning light I was walking in today. The path is stony and rocky, a little boggy in places, and cut by dozens of tiny streams and some much bigger ones. It’s overlooked by huge mountains on all sides; rugged, towering and the most mountain-like mountains I’ve ever walked beneath. 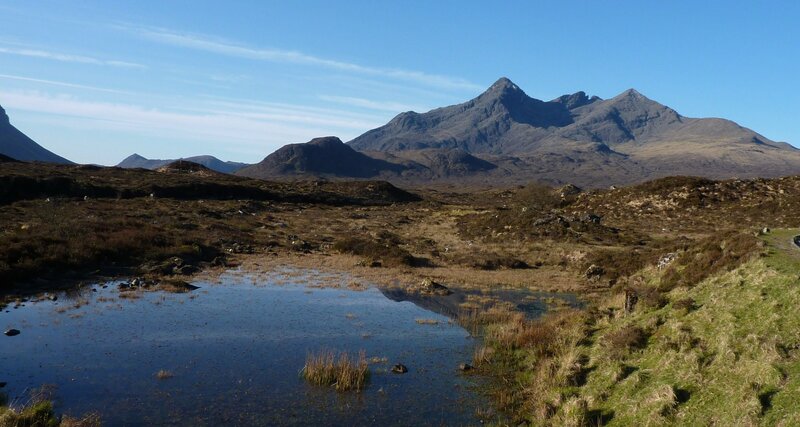 To the right is Sgurr nan Gillean, complex, broken and craggy and (I think) the location for the scene in Highlander where Macleod and Ramirez are sparring high above the valley below. 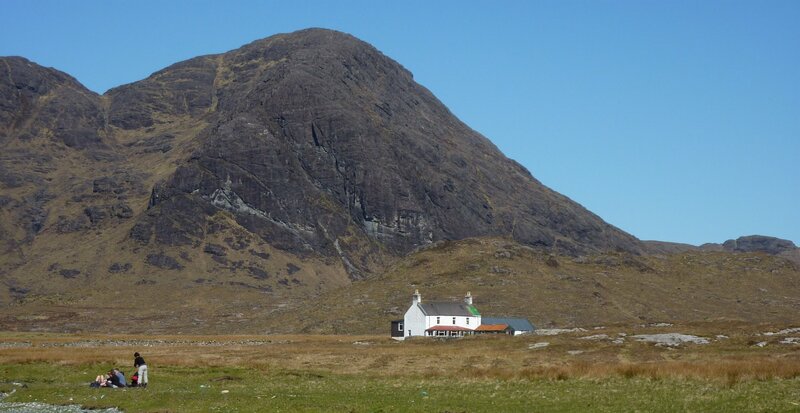 To the left is the immense bulk of the double topped Glamaig. Ahead and to the left is Marsco, with an inviting ramp of an aspect that is begging to be climbed, but not today I’m afraid. The main problem with the path lies in keeping your feet and not stumbling all over the place as you gape at your surroundings. Before long I could see the valley bending away to the left, around the back of Marsco. 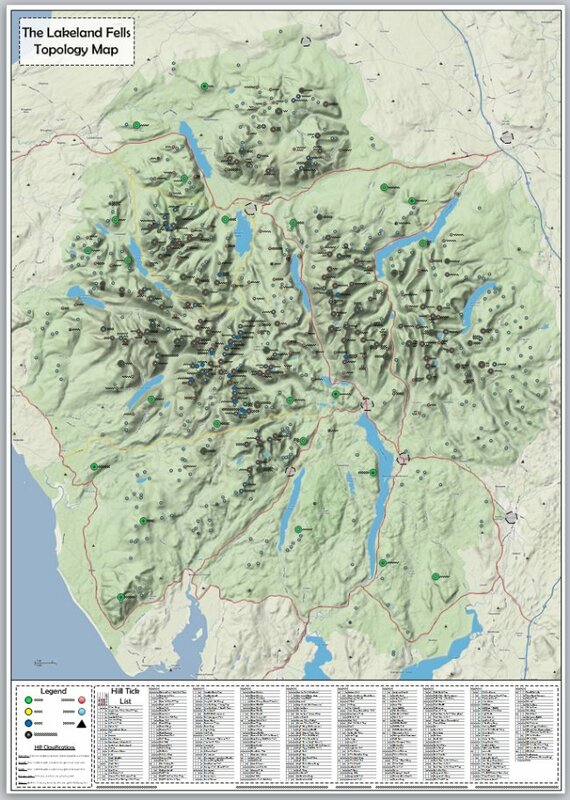 I passed two small lochs on the right apparently both named Lochan Dubha according to the map. It was at about this point that I came to what I had been calling “The Decision Cairn”. Go left for the easier path down to Camasunary or go right for Loch Coruisk and the Bad Step. I’d already made the decision, so it was easy to keep left at this point. The path to the right climbs up and over and drops down the other side of the hill to the loch. The path to the left stays mostly flat, dropping down if anything and the views improved as the valley opened up. On the left now was Bla Bheinn; huge, towering and impossibly steep, also impossible to photograph with the sun sitting directly above it. On my right was the first of two large lochs (Loch an Athain) perfectly flat and mirror smooth in the still morning air. Ever since leaving the hotel I’d been following at least one and possibly two sets of footprints. It was hard to gauge how long they’d been there, but I expected it was a couple of very early starters, ahead of me on the path. 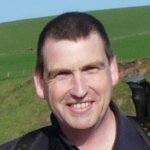 The only trace of them was wet boot prints on rocks as they’d splashed through the burns, but even though there were long straight sections of paths where I could see a good distance ahead, I’d not seen them. I now found them. Apparently, the chill of the night had prevented the boot prints from drying out, as these two had spent the night at the side of the loch, in one of the most spectacular wild camps. I didn’t pass close enough to talk, but I waved a greeting to one of the guys washing his kettle in the loch, and he waved back. I got some semi-arty photographs of the loch and the reflections of the surrounding mountains in the mirror of its surface. The section between Loch an Athain and the second, much larger Loch na Creitheach would be quite muddy and troublesome in wet conditions, but it wasn’t too bad today. I managed to skip round the worst of the mud and step over many of the boggy sections. There were a lot of bike tracks in the wet sections, which surprised me; I thought it would be too rugged to get a bike down here. Beyond Loch na Creitheach the path gets boggy again as it wanders down to the rather incongruous large house in Camasunary Bay. I went ankle deep here into a wet sludgy puddle, the worst dunking so far, and simply due to me not paying attention to my feet. 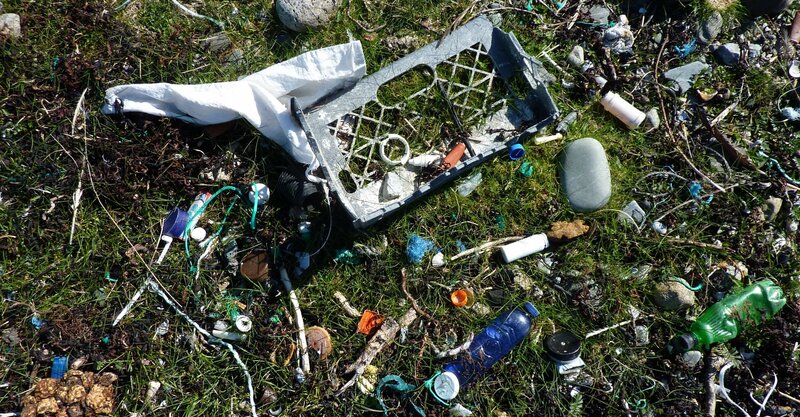 The bay is wonderful, peaceful and almost completely covered in plastic litter debris – it’s shameful and quite startling to see. 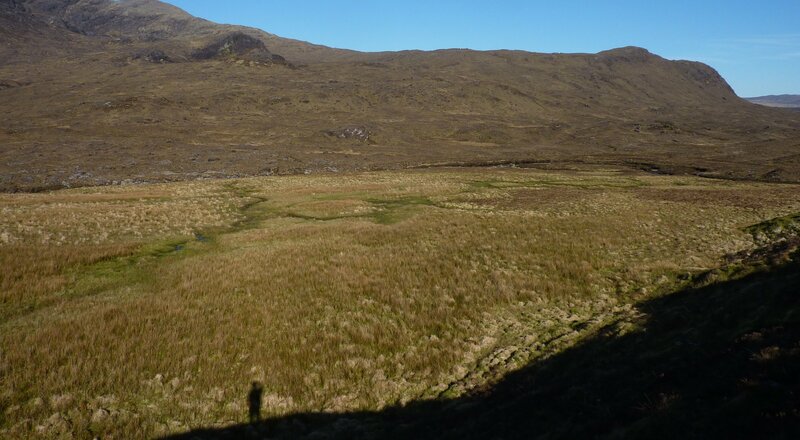 I arrived just behind a large party of Dutch walkers who had come along the 4WD track over Am Mam from Kirkibost. We chatted for a short while about our respective plans and about the incredible weather (it’s not just a British disease, talking about the weather to strangers). They were all incredibly friendly and interested to know about my “top to bottom” walk and I described it. They were equally as dismayed about the amount of litter on the ground. I initially thought it must be generated by the people who had been using the house and the bothy, which is situated further round the bay. But it quickly became clear that this was littering on an industrial scale. 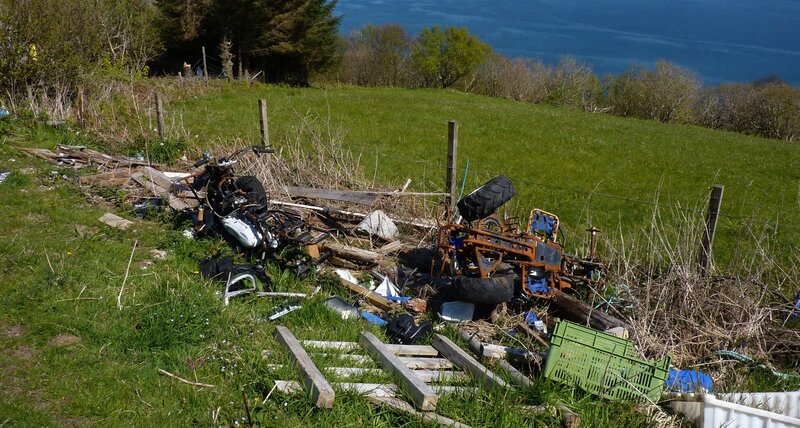 There’s no way a thousand backpackers could generate this much waste, not even over 10 years. I concluded this waste must be coming from passing ships. You think about any buoyant waste product, and it was here. Plastic made up the bulk of it, thousands and thousands of plastic bottle, containers, crates, huge drums, ropes, lines and nets, shoes and much, much worse. Shampoo bottles! I must have seen 500 shampoo bottles in the mile or so of shore I walked along that day. I never realised sailors have such ‘ealthy lookin’ ‘air as David Ginola used to say. Head and Shoulders is apparently the preferred brand of your average mariner. I said my goodbyes to the Dutch and left them to laze on one of the cleaner grassy sections, eating lunch and exploring the litter strewn beach. I followed the very narrow path as it climbed up the slope above the rocky coast. The views behind were stunning, but I had to concentrate on my footing, as this is a potentially dangerous section of path. A huge drop to the right, sometimes screened by trees, but more often not, threatened to plunge me to the rocks below. The route notes say that walkers have fallen from here, and I could believe it. The path soon drops down to another sheltered and grassy cove at Glen Scaladal. This is the worst thing about coastal walking; the numerous steep descents and ascents as you drop into and climb out of these little coves. A new path gate has been installed just before you reach the beach, probably to try and keep the sheep off the path and prevent them from falling onto the beach below. The path beyond Glen Scaladal keeps close to the cliff edge again and I started to look for somewhere to site and each my lunch. The sun was quite warm now so I looked out for a shady area and eventually found an overhanging rock with a handy rock beneath it to sit on. The only downside to this location was the almost vertical cliff beneath me, dropping a couple of hundred feet to the rocks below. 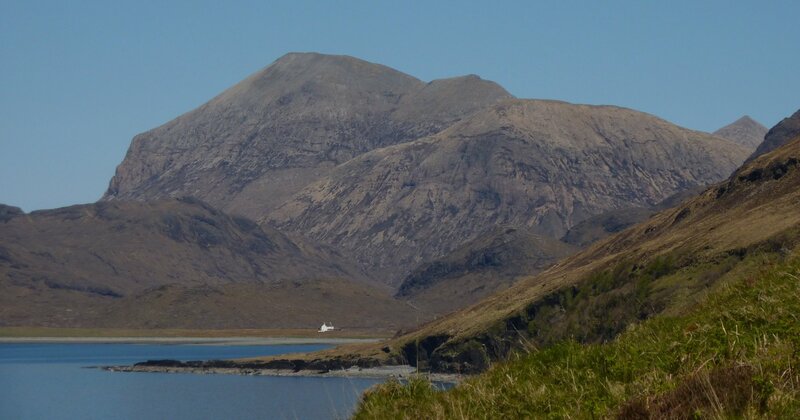 The view from my lunch spot was magnificent – crystal blue water, stunning mountain vistas, distant grey hills and little boats chugging back and forth across the loch shuttling visitors to Coruisk. I perched on my seat on the path munching my butty when what I thought was a bird, flew directly over my head, out towards the loch. A second later an enormous explosion of sound almost had me jumping in the air – probably to my death on the rocks below. The bird was an RAF fighter jet, screaming out across the loch, heading straight for another jet that I now saw; coming in fast from the left. Together they turned to the right, one chasing the other and roared off around the bay and down into Glen Sligachan – taking three or four second to cover the distance it had taken me all morning to do. 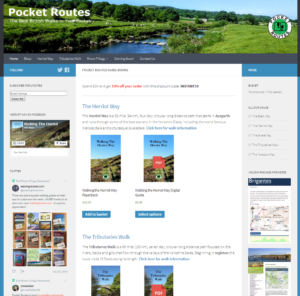 I settled back onto my rocky perch and was almost instantly on my feet again – a young lad, about 10 or 11 years old I guess, poked his head round the rock to my left, checking the path – he was almost as surprised as I was. I shuffled as far back against the cliff face as I could, picking up my pack from the path and letting him pass. I apologised for getting in the way, but he said nothing. He was soon followed by his twin brother and slightly younger sister – none of whom said a word after their initial wide-eyed stare. Seconds later Papa followed, clucking warnings and observations to the kids in French. He at least said Bonjour. He was then followed in turn by his wife who had their youngest child strapped to her back with a jacket, in a sort of make-shift papous thing. They all looked very nervous, especially Madam. I don’t think they’d been expecting such a treacherous path and they certainly weren’t equipped for it. The path becomes easier after a while and it soon climbed up across grassy fields and before long I was walking into the outskirts of Elgol. I stopped and chatted to two older ladies out for a stroll, commenting on how good the weather was. “Oh, it’s always like this” the younger one said with a twinkle. I continued on, around the bottom of the village, past the pier and harbour and up to the village shop. It was a little oasis of cool and shade. I was concerned about getting burnt today. My Tilley keeps the sun off my face, but I won’t use suncream, I hate the feel of it on my skin and it makes me sweat, so I stick to covering up as best I can and not sitting in the sun for long periods. I sat in the shop, in the cool and scoffed a couple of Feast lollies, two cans of Irn Bru and a half litre bottle of water to top off my Platypus. I mentioned to the lady who runs the shop that there are plenty of bigger villages in the Lakes and the Dales that can’t support a shop any longer and I was surprised this one managed to stay open. She explained that the summer tourists just about paid for the shop to stay open all year round – covering the cost of running it in the winter when only the locals use it. She also mentioned that a new arrival in the village had started selling tea, coffee and refreshments around the corner, part of a new boat service and they were taking enough of her business to make her existence a tenuous one. The main problem was that the new competition was not run by a local, but by someone who was only here for the summer tourist business and come winter they’d be long gone. However, so would the shop if it didn’t make enough during the summer. 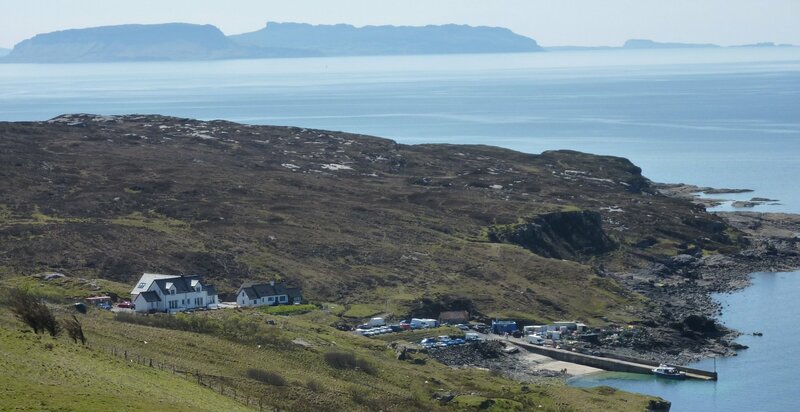 So if you’re passing through Elgol, be sure to spend a few quid in the shop – you’ll be helping the local community maintain a valuable local resource. After my rest stop I walked out into the sun again and along the road out of the village. I stopped at the nearby trig point and was treated to another aerial display from the RAF fighters. The view from the trig point was incredible and it was hard to persuade myself to move on, along the road. I was walking the minor road to Glasnakille though, not the ‘main road’ to Torrin and Broadford. At the end of the tarmac I passed the most disgusting mess I’ve ever seen outside a farm. The whole frontage of the farm was littered with old car parts, junk, scrap metal and rubbish. 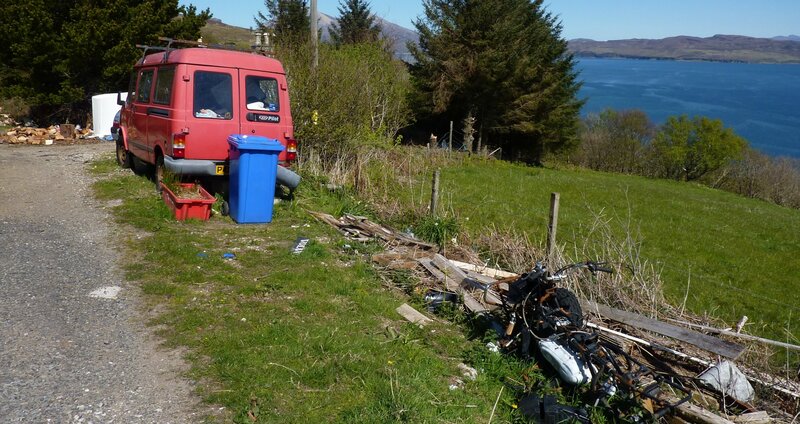 For several dozen yards I walked past decaying ruins of vehicles, a transit van packed with rubbish and all sorts of other detritus piled beside road. How do people get away with this? The road expired and I followed the 4WD drive track beyond. This dropped into the little wooded ravine of Allt na Cille and out onto the open hillside above it. Here it met another tarmac road and I decided to stick with this, rather than take the coastal path into Kirkibost. The road is quiet enough and it had great views all round, there is also a verge for most of it, so you’re out of the way of any passing traffic. As I approached the little roadside car park at Kirkibost I saw Roger and Molly crossing the road, returning from a short walk up the track. I flopped into the car and heaved my boots off. This had been the best day of the trip so far and one of the best day walks I’ve ever done. 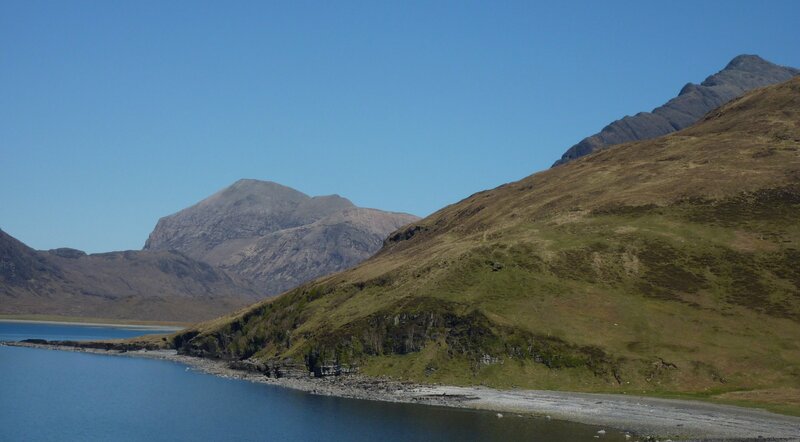 The scenery was magnificent and the weather was superb, it will be difficult to get a better days walking than this. We retired to the Isles Inn and had another great meal and another fun evening in front of the roaring fire in the croft. 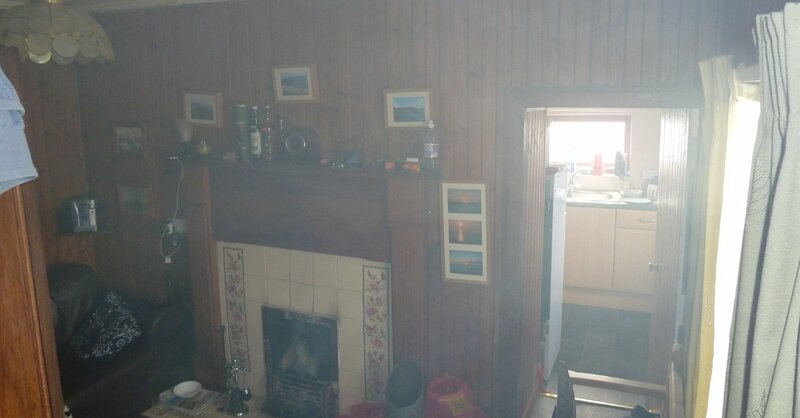 The only downside is the amount of smoke the fire seems to pump into the living room, I think the chimney must be blocked! It’s getting a bit smokey in here!